New expressions of natural rhythms. Just southeast of the Denver Federal Center lies a typical suburban neighborhood. Streets meander in curves and cul de sacs around split-level and two-story homes from the 1960s and ‘70s. Among the standard trappings of swing sets, basketball hoops and autos big enough to seat several children, one structure bears the distinction of large abstract sculptures in the front yard. This is the studio of artist Sushe Felix and her husband, Tracy, also an artist. Other than the large sculptures on the right and left of the sidewalk, you wouldn’t have a hint that the house shelters the fruition of a lifetime of artistic ventures. Felix, an elegant and thoughtful woman in the prime of life, has devoted virtually all of her adulthood to her work. Her studio and residence are housed in an airy, open building with a modernist feel. Plenty of windows allow light to pour into the rooms, which are filled with art collected by the couple as well as their own work. 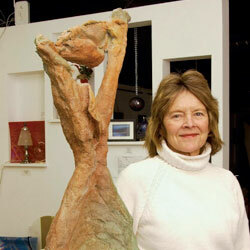 They moved here several years ago, seeking a larger art community as well as proximity to Denver galleries and shows. Hometown for Sushe and her husband was Colorado Springs. 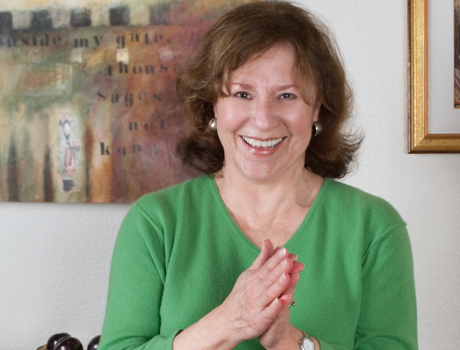 After school and college at Arizona State University (Tempe), she reconnected with Tracy, and the couple launched their careers in Manitou Springs, supplementing their livelihood with an art gallery and frame shop. To accomplish this end she combines geometric and organic forms, which may be grounded in landscapes and figures but increasingly have moved toward more abstraction. Palettes of vibrant yellows, oranges, blues and greens, distinct edges and intersecting forms appear frequently, whether in a piece she’s working on today or in the body of her work in the past two decades. This was not always the case. One painting in her studio from her early career shows a definitely female, if enlongated, figure. Felix characterizes her work in the 1980s as a “figurative expressionism period” and “a kind of Thomas Hart Benton phase.” Benton, active in the 20th century, was a painter and muralist at the forefront of the regionalist art movement. His fluid, substantial, almost sculpted paintings showed everyday scenes of life. Felix’s work from this time demonstrates the same fluidity, but her subjects are based on mythological figures set in Western landscapes. Then in 1991, while trying to find a new artistic direction for herself, Felix came across an old flyer about the New Mexico modernists, specifically the Transcendental Painting Group based near Santa Fe in the ‘30s and ‘40s. Although these works are abstract, they were based on nature and had a landscape feel, along with bright colors. Chief among her favorites was Raymond Jonson, who was himself influenced by the avant-garde works of Wassily Kandinsky, one of the first abstract artists. Though enamored of the New Mexico landscape and light, the group aimed to validate and promote abstract art by moving their paintings beyond the limits of the visible, physical world, and find new ways to express space and color and light. Felix explains that these artists sectioned off the composition and started to abstract the landscape. The appeal of this approach to Felix includes the simplified, dramatic lights and darks, as well as its abundance of geometric shapes combined with organic forms. She explains, “The geometric makes it abstract,” while the organic components, such as convex and concave shapes, seem naturalistic and earthy, like leaves and plants and landscapes. She says, “In some pieces I will veer into a more recognizable venue; in others I become completely abstract, using geometric form to create the piece. Regardless, in each work of art I strive to create an orderly composition using both geometric and organic forms.” The combinations feel joyful to her. Felix works in two and three dimensions. Her two-dimensional pieces may start as pencil drawings or studies, or she may just begin painting with acrylics. At times she adds paper and foils in a collage approach that combines well with acrylics for different types of texture and to add visual interest. She prefers acrylics to oils because acrylics layer quickly, and the artist can put color over color rapidly and blend them. A recent series of abstracts started small on ragboard (frequently used to mat art, it is 100-percent acid free and similar to poster board in weight) not much larger than the size of a typical piece of typing paper. The advantage to this approach is its ease. She can try variations in composition quickly and easily, mixing small areas together. From this she now is developing larger abstracts. On the other hand, Felix continues to use recognizable shapes. For an exhibition at Sol y Luna Gallery in Puerto Vallarta, Mexico, she created vibrant creatures — an iguana, snowy egret, koi fish and others. The current show at William Havu Gallery in Denver features pencil sketches and the larger paintings that developed from them. For other shows, she’s been inspired by a theme such as the West or Native Americans. “This change keeps it (the work) fun,” she says. Whether her work is fully abstract or based on recognizable objects, Sushe often produces pieces in a sequence or set because she enjoys creating a collection based around a concept or a theme. The inspiration may be an upcoming show, but, she adds, “I have to enjoy doing it or I wouldn’t.” And while the art market may influence her work, she must find an interesting or compelling angle to express, not mere potential popularity. If no exhibitions are scheduled in the immediate future, she tries new concepts. Less frequently, Felix sculpts, usually using clay. Mythological themes predominate, still simplified, but not completely abstract. 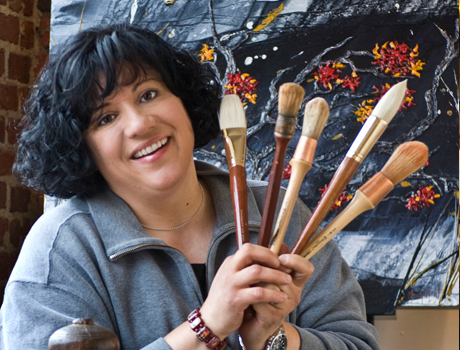 Art has been a passion for Felix since childhood, and she knew it would be her life’s vocation. Her mother, who is a docent for the Colorado Springs Art Museum, trotted Sushe and her older sister to art classes at the Bemis School of Art, Colorado Springs Fine Arts Center, as well as exposing young Susan (her given name) to ballet and piano. Being realistic as well as artistic, Felix thought she would probably have to have another job in addition to art in order to support herself. Once in college, she considered commercial art, but one class was enough to dissuade her, and she majored in fine art. Following graduation, she contemplated clothes design. With the optimism of the young, she produced some pieces noted in her mind now for being New Wave with “plastic collars and Chinese characters.” This is when her professional moniker of Sushe was created, from her love of Japanese sushi. She decided to continue using it because of its distinctiveness. Felix’s first solo show occurred at Abacus, a now defunct Denver gallery, in 1989. Since then, she’s been fortunate to support herself primarily through her art and related activities. A strong partnership with husband Tracy seems mutually supportive. Yes, she and Tracy may submit for the same show. Sometimes one gets accepted and the other doesn’t. But they acknowledge this fact as part of the artistic lifestyle. With a routine as regular as any dedicated worker’s, Felix’s typical day includes a very early lunch, after which she heads to her studio for a full afternoon. Some pieces take longer to resolve than others, and she may let one of these rest for a while before completing it. However, she never reworks a piece once it’s finished. Felix’s neighbors are friendly but not intrusive. On their strolls, some residents bring their children or grandchildren to look at the outdoor sculptures and chat about their offsprings’ interest in art. From her Lakewood base, she plans to continue her involvement with the Denver art community. Felix currently is represented by William Havu Gallery in Denver and Adieb Khadoure Fine Arts, Santa Fe. The next step may be expanding to a gallery in Scottsdale or Texas or Kansas City. Like most artists, she continues to seek new venues because art is not only expression but also contact among people. 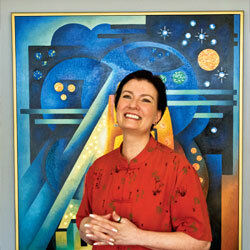 The diverse group of people (individuals, businesses, museums) who buy her work are “a delight to talk to,” she says. Looking back over her life, Felix says, “I’ve come to the conclusion that I’m very lucky to be able to work in my studio every day.” She focuses on living in the moment, making the people who view her work happy. “It can’t get any better than that,” she concludes. See more of Sushe Felix’s work at www.felixfineart.com/index.html. In Denver, she is represented by William Havu Gallery at 1040 Cherokee St., (303) 893-2360. Her pencil drawings and paintings inspired from them will be featured in a show there from April 17 through May 23, along with works by modernist Werner Drewes.